I signed up at the VERY last moment for MoFo (Vegan Month of Food) this year. I’m so glad I did! Even though I took a couple weeks break in the middle due to a work trip (read about my food adventures in Los Angeles here and here), I really enjoyed writing about food (especially NACHOS) for the month of October. I can honestly say that I never got tired of eating nachos this month. I even ate nachos multiple times without taking pictures or blogging about them. I just really do love nachos that much! 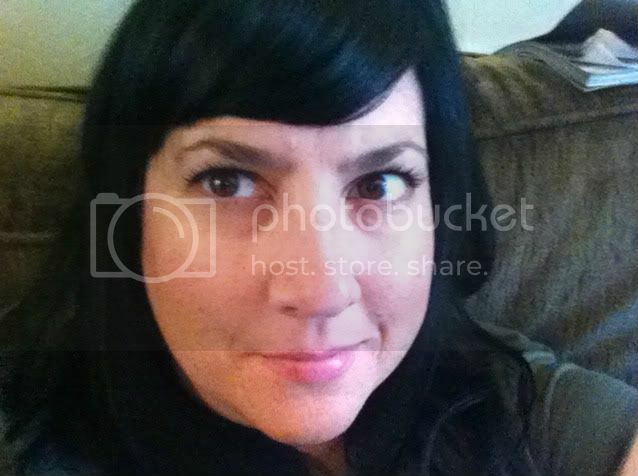 I discovered tons of new and interesting blogs and made some new bloggy friends! And of course I kept up with my regular vegan food blog reading. I will definitely participate in Vegan MoFo again next year. I’ll be thinking about my theme for the next 11 months or so… but it will probably end up being Nachos again- I mean- why not? A few of my friends have crowned me “Queen of Nachos”, so I think I’ll roll with it! Chocolate and peanut butter is my favorite flavor combination for sweet stuff. I created this recipe for Kala of VeganCraftastic‘s fabulous Halloween Zine called “Late October”, which she is selling in her etsy store. 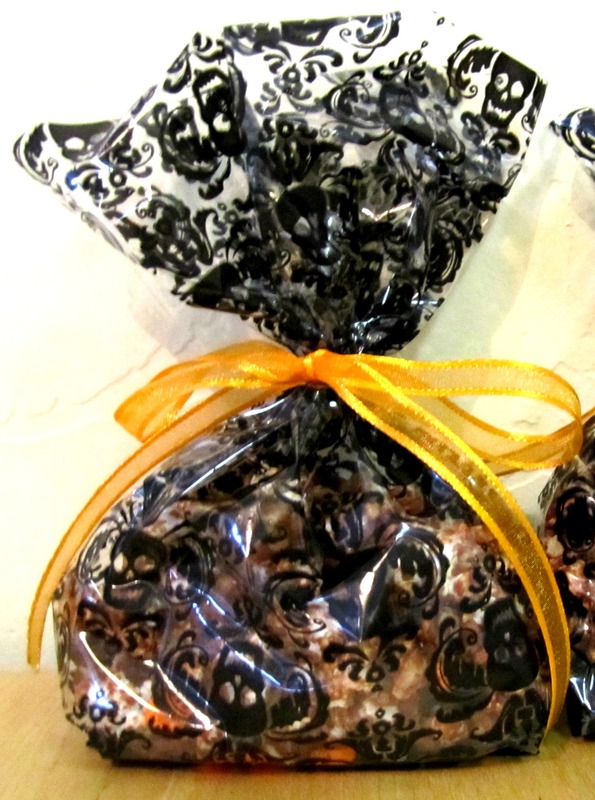 This would make the perfect treat for a Halloween party, to give as treats, or just to eat all by yourself! 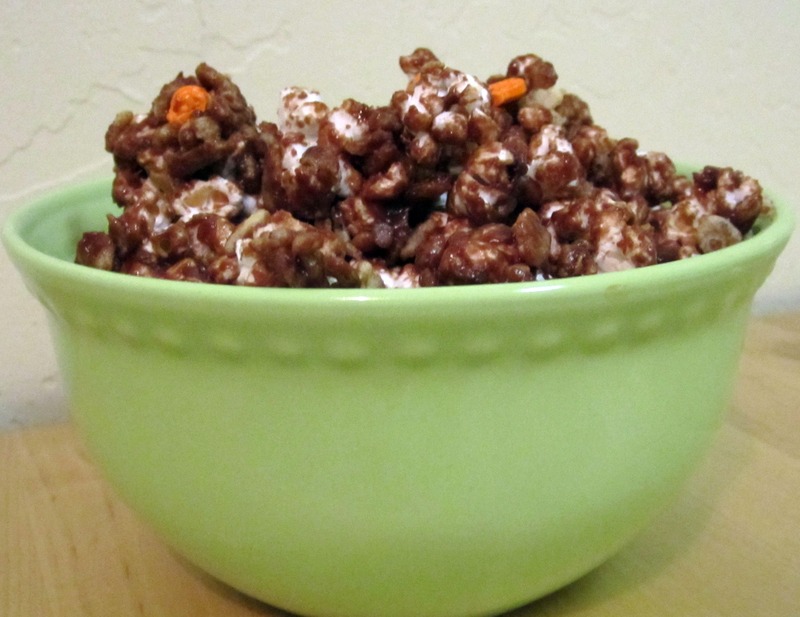 Mix the popcorn and cereal together in a BIG bowl and set aside. In a small sauce pan heat the syrup till bubbling. Add the sugar and stir constantly till dissolved. Add the peanut butter and stir until melted and incorporated. Add the vanilla, chocolate chips and salt and continue to stir until completely melted and combined. Immediately pour over popcorn and use a wooden spoon to stir it all around until evenly coated. Work quickly so the liquid doesn’t harden. Mix in the tiny candies. Spread on parchment or wax paper in an even layer and let cool for at least an hour. Serve in a big, festive bowl, or divide up into goody bags and give as treats! I’ve always loved group exercise classes. I took an old school aerobics class with my mom and sister held in a high school gymnasium when I was little. I LOVED it. I took dance throughout my childhood and while I may not have been the star of the class, I sure had fun! I still love to get my dance groove on, especially with a bunch of other people having fun too! In high school I took Step Aerobics classes all the time and also a class called ‘Stretch & Relax’, which was yoga but the YMCA in the early 90s did not want to call it that! I’ve always wanted to teach aerobics and several years ago I started taking Turbo Kick classes (cardio kickboxing). I was immediately addicted to this format and I thought- I HAVE to teach this. It is so fun! But I didn’t bite the bullet and figure out how to actually get certified to teach until this year. The first step in the process was to obtain a Primary Group Exercise certification through once of the nationally recognized aerobics and fitness organizations. 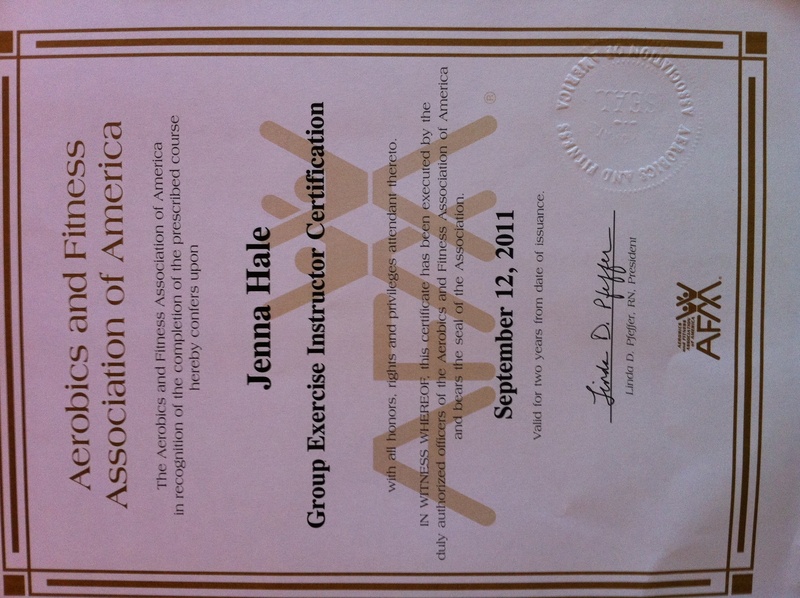 I chose AFAA (American Fitness & Aerobic Association) because it has a good reputation and also because they have a discounted testing program twice a year. I received my study materials (a GIANT textbook and a study guide, along with a supplemental text book) this summer and had a few months to learn the material. I studied my little heart out and finally the big day came! I drove 117 miles to downtown Los Angeles to attend a day long workshop and examination. We spent the majority of the day practicing our routines and reviewing the materials as a group. The test consisted of a group practical exam where we had to show various exercises and stretches for different muscles groups as the muscles were called out. This went on for what seemed like a very long time. I was sure sweaty when we were finally done demonstrating all the exercises! Next we had to do the individual practical portion where we basically taught the class on our own- showing a specific muscle strengthening move, a stretch, or a cardio routine, showing beginner, intermediate, and advanced modifications, whilst smiling, maintaining eye contact, continually talking about form, alignment and safety… all within one to two minutes!! Oy- that was tough, but fun! I was soooo nervous! But once I got up in front of the group I was just excited. I felt at home. I kept repeating to myself the entire day, “I was born to do this. I was born to do this.” It worked! I was born to do this! I want to bring fun, dancey, sweaty, healthy exercise to people that might not normally be inclined to do it! I was afraid I would be the biggest person in the room. I was afraid I would be the oldest person in the room. I was afraid of a lot of things. But I was dead-wrong. There was every kind of person, from all walks of life in that room. There were 92 very different individuals with 92 different bodies, faces, points of view, and personalities. It was an amazing experience that I will remember with love forever! It takes 4-6 weeks for the results of the testing to arrive in the mail. The test was a couple weeks ago, so I now have 2-4 weeks left? I feel confident that I passed. I’ll find out soon enough!